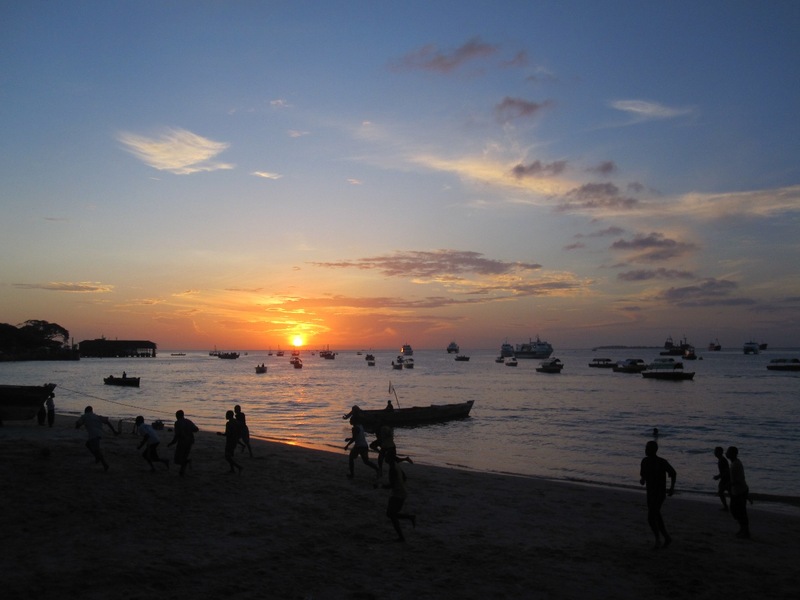 Welcome to Zanzibar – not just a funny name, it’s hot and muggy too! Boy, hit the nail on the head there, Phil. We’re just kicking the tires on the rainy season now so the temps are ramping up, the clouds come and go with no rhyme or reason and when it does actually rain it comes down fierce, and it’s tough to tell if that makes it less or more humid. 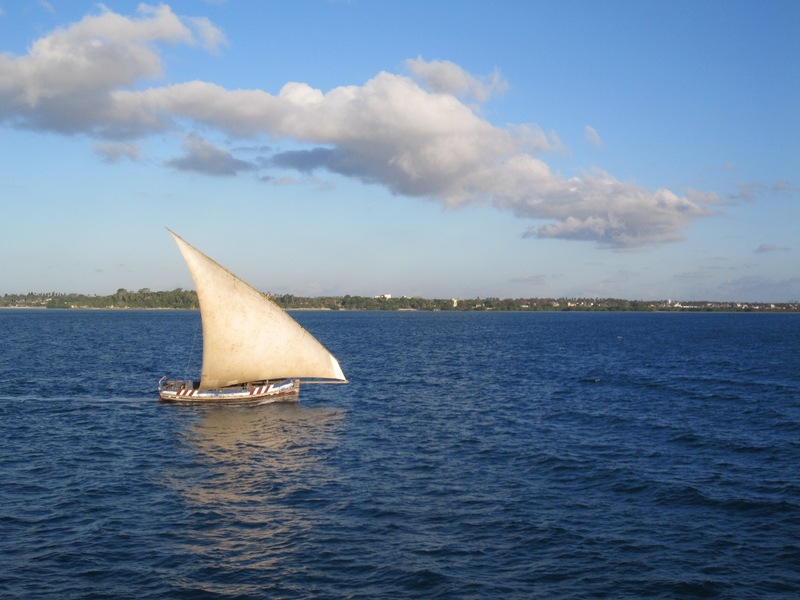 Nonetheless, Zanzibar, being an island and all, is practically surrounded by water, and, when the tide is out at least, some really nice beaches as well. Can’t have it both ways in most areas, though – tide is out, beach but no swimming / tide is in, you can swim but no sand in sight. You think our life is easy, you don’t know these problems we face. Got in a bit late on the ferry and ended up spending our first night in the elegant port area, with its wonderfully vibrant collection of dead fish, unsavory characters, nasty looking dog/rat hybrids, plenty of ominous shadows and, of course, papasis, which is Swahili for “ticks”, and the term used to describe the hordes of erstwhile touts so generously on hand to greet you as you disembark, offering all manner of services such from hotel directions and city tours to weed and incredibly uncomfortable small talk. I also convinced Laynni to go “off-guidebook” and stay at a place I found on-line which, despite all the bad reviews in the past, including allegations of bed bugs and ritual theft, more recent reviews had greatly improved, in particular people talking up the free tea, which obviously outweighs any niggling concerns regarding safety or cleanliness. Bright side – nothing got stolen. Dark side – Laynni got literally savaged by bedbugs (do I pick the right twin bed every time or does my menacing demeanor and epic temper continually persuade them to take their parasitic ways across the room? Sadly, we may never know for sure…), had a horrible night’s sleep and spent the next several days alternately scratching and struggling to avoid scratching, all the while obsessing on which areas of her itchy, spotted hide were getting better and which, like The Simpsons, were still getting horribly and systematically worse. And we never were able to decide if it was bed bugs, heat rash or just a blushing reaction to my charm that caused the strange inflammation on her neck that, for my money, most closely resembled diaper rash. 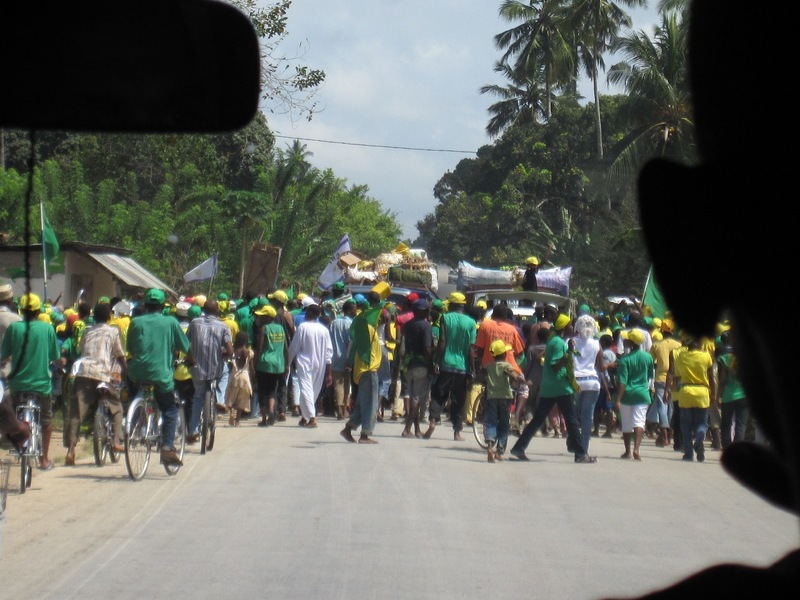 The next day we headed to the north end of the island amid raucous celebrations in every village along the way. 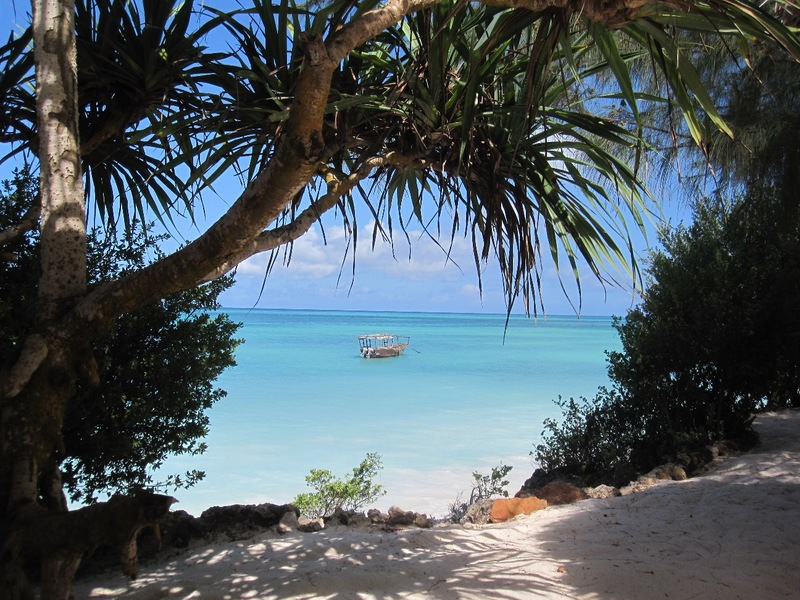 We had arrived in Zanzibar on the day of the national elections (despite specific warnings in Lonely Planet to avoid the island around this time – whoops) but in a strangely fortunate turn of events somehow everyone appears to be thrilled with the results. Apparently it has something to do with a prior referendum, a coalition government agreement and the possibly dubious outcome of 51%/49% for the incumbent which ensured that the underdogs were still happy enough with just a piece of the pie. End result for us – just a somewhat longer drive across the island threading our way through large colourful crowds of jubilant islanders celebrating on the streets, the adults in response to the result (however predetermined it may have been) and the children presumably because the entire week was declared a school holiday, and because everybody else was cheering. Tanzanite Beach Resort on the quieter eastern side of the Nungwi coast. Dazzling views out across the vastness of the Indian Ocean where it felt that if you look really hard, and maybe squint a bit, you could almost see India, and maybe just be able to make out someone doing something really gross there, probably. Great hotel where, for us anyway, sloth was the word of the day, well, sloth, and surfing the internet on their free wi-fi till my eyes bled. And got some laundry done. Can’t beat it with a stick. Long story short, I never did manage to get the condom back into the package properly. 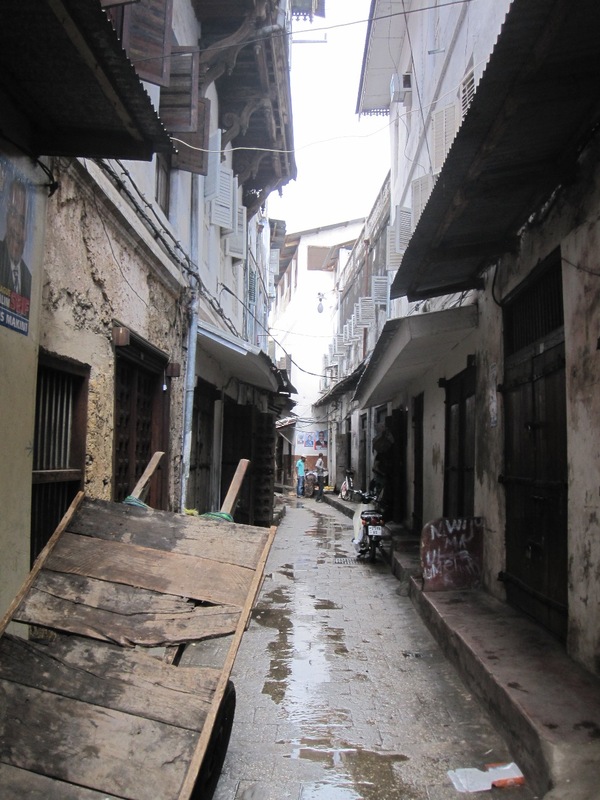 After a few days we headed back into ancient Stone Town where, once we made it more than a couple blocks from the port, turned out to be a fascinating maze of narrow alleys, crumbling arches and medieval architecture. You could almost taste the presence of codpieces. The advantages of a perplexing warren of constricted passageways – captivating surprises around every corner, a pervasive feeling of having stepped back in time, and all day shade. The downsides – always being within arm’s reach of guys trying to sell you elephant carvings and Hakuna Matata t-shirts and the rapid conversion of alley to river whenever it rains, the water swirling around your ankles smelling suspiciously similar to my hockey equipment after a City Park sewer back up and 6 months in the basement. Not even Robert Duvall loved the smell of sewage in the morning, although I certainly can’t speak for Charlie Sheen. Lyle and I took some time out of our busy schedules to explore the Old Fort, the imposing guardian of the city and majestic introduction to Zanzibar, and did our part to help finally fulfill one of the key dreams the Omani Arabs had in mind when they built it 300 years ago – having white people drink beer and watch soccer in plastic lawn furniture. Side note: we have had more cutlery set in front of us in Africa than a Bulgarian can shake a koledarka at, as though every meal is going to be an 11 course feast of succulent breads, steaming vegetables and recently impregnated meats. In fact, if we were to dump all the cabbage and rat feces out of a burlap sack, then collect all the cutlery we’ve been given over the past two months inside this sack, then arrange passage on a Trans-Atlantic steamer, then have it picked up and bused to Saskatchewan, where maybe one of you could pick it up for us? Then you’d see that we’ve had a lot of cutlery. But that’s just not practical. Nonetheless, fork or no fork, our last stop was at Imani Beach Villas, located in a small fishing village just about 10 km north of Stone Town where you could catch a glimpse of local life from an ocean front lounger, admire the view from the comfortable tree house or, like us brave souls, make your way over the rocks at high tide for a brief sunset float in the salty buoyant water amid traditional fishing dhows and the occasional discarded oil filter. Oh, Africa, you dog, you. Meanwhile, Family Locke undertook a minor charity project, heading down to a local school to dole out some pens and pencils that they’ve been lugging all over Tanzania that were sent by Taylor’s class in P.A. The children were apparently very excited to practice their English enthusiastically and in unison – “HELLO TEACHER! HOW ARE YOU? WE ARE FINE! THANK YOU! THANK YOU!” And, while the gesture was definitely well intentioned and clearly appreciated, it was obviously a mere drop in the bucket – note the photo of the kids soaking up their book learnin’s under the trees – and those are just the ones that don’t have a classroom of their own, the school itself is entirely full, often with around 100 per class). In the end, though, maybe their most memorable gift was that of laughter – the unintentional humour provided by the opportunity to gaze upon pale, somewhat embarrassed foreigners on an otherwise ho-hum Wednesday morning. As Jack Handey once said, “Dad always thought laughter was the best medicine, which I guess is why several of us died of tuberculosis.” Either way, the most fun you can have without a search warrant, or so they tell me. And that about does it for Zanzibar. At least we got that over with.